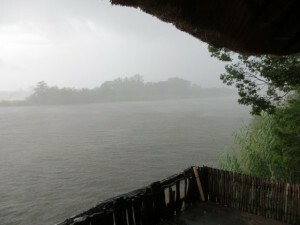 We left Botswana and headed north into Namibia where we spent a night on the Okavango River and experienced a tropical downpour. It bucketed down so much we worried the bike would sink slowly in to the soft dirt. It survived. 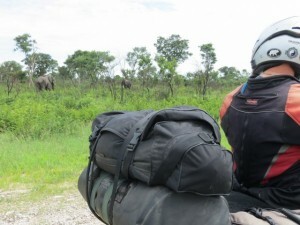 Riding through the Caprivi National Park (one of the few we are allowed in on the motorcycle) we encountered elephants on the side of the road. They are magnificent creatures. Our next stop was Zambia. 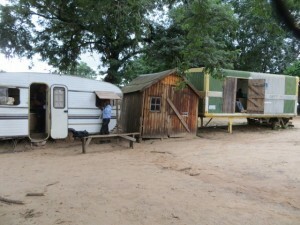 The border post was a higgledy-piggledy array of old caravans and portable buildings. They certainly know how to charge international travellers. The visa was $US80 each. Ten bucks to process the carnet (unheard of anywhere else in the world). Another ten for the road safety tax and more than 570 Rand for the insurance and another ‘council’ tax. 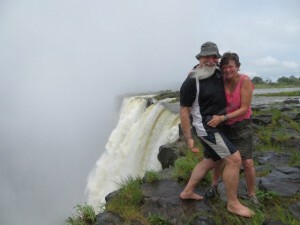 We stayed at Livingstone in the ZigZag Guest House – a really wonderful B&B run by Lynne and her Namibian husband, Vasco. 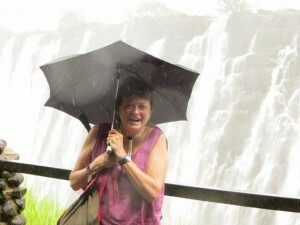 We visited the Victoria Falls on the Zambia side. No matter what the weather, a raincoat is the order of the day. The spray from the falls as millions of litres cascade down nearly 100 metres is drenching! 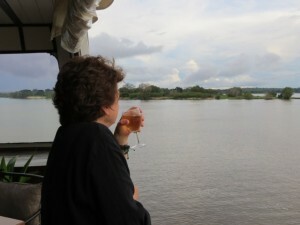 Not to be missed is a leisurely sunset cruise along the Zambezi River. We didn’t experience a sunset but we did see the hippos and enjoyed a relaxing couple of hours drifting along the mighty Zambezi. 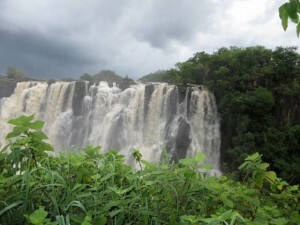 Standing at the very top of the falls on Livingstone Island was a heart-stopping, drenching and exhilarating experience! Crazy! Just metres from the falls! 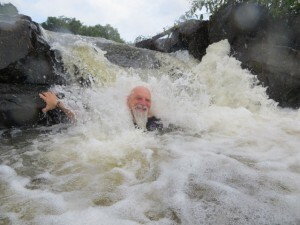 Brian even took a dip in the ‘Jacuzzi’ at the top of the falls – crazy! 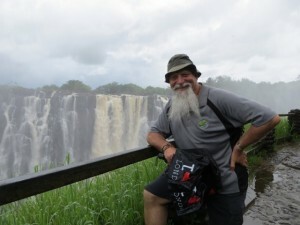 A trip to Zimbabwe to see the falls from the other side was another expensive exercise. $US30 each for a visa to spend a few hours in the country! It was expensive but well worth it. 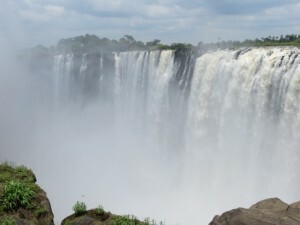 It gives you a whole different perspective to see the falls from Zimbabwe. 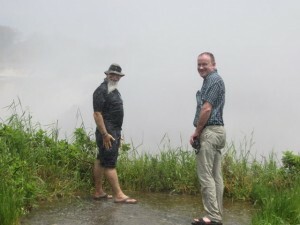 It was another ‘wet’ visit! Brian and James, an Irishman we met at ZigZag, could have been anywhere when this photo was taken! I can guarantee they were overlooking the falls! 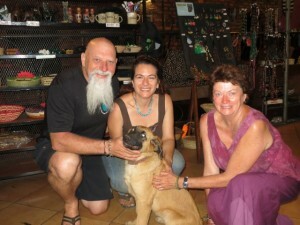 We said goodbye to Lynne and the great staff at ZigZag and headed south. 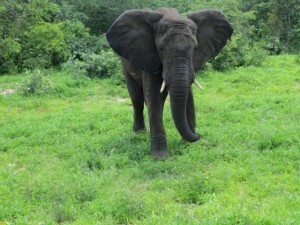 Next stop Kruger National Park, via Botswana. 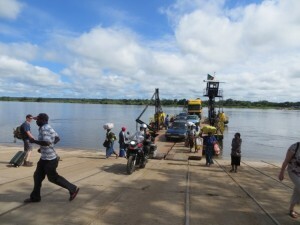 Crossing back in to Botswana - just like South America! 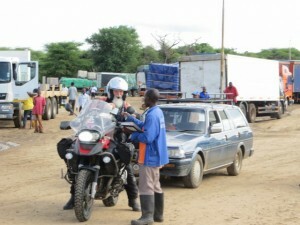 We thought we were back in South America when we hit the Zambia/Botswana border. Muddy tracks, stiflingly hot offices, touts who want money to help you through the border process and a river crossing! 45,000 kwacha for the ferry and 5,000 for our helper and we were on the river and ready to face a long ride through Botswana and then back in to South Africa. And what a treat the road from Zambia to Francistown in Botswana held for us. 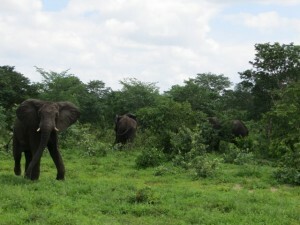 We lost count at 50 wild elephants along the way.